With this patented kit, you can easily repair kitchen counter tops, cabinets, or any plastic laminate such as wall paneling, furniture, or desktops. There are dozens of repairs you can do in your car, truck, SUV, boat or RV. 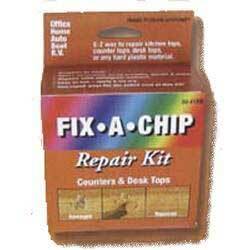 If you like to repair or restore furniture, or you have chipped Wilson Art, this kit is just what the doctor ordered!